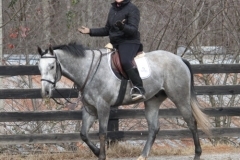 Monarch’s Reign was purchased by Suellen Slockbower of Roswell, GA in December 2010 as a Prospect Horse from the Bits & Bytes Farm Web site. Read Monarch Reign’s Success Stories. 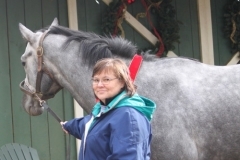 Monarch's Reign was purchased by Suellen Slockbower just before Christmas 2009. She saw him as a Prospect Horse on the Bits & Bytes Farm Web site. Look Ma, no hands! Elizabeth got the first "test ride" on Monarch's Reign - December 26, 2009. 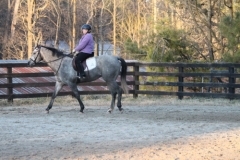 Suellen Slockbower rides her new off-the-track Thoroughbred. Monarch's Reign had a reputation of finishing his races without his rider! 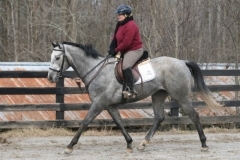 Cold weather and snow kept Suellen form riding her new horse the past few weeks. Today on their second ride together, Suellen and Monarch worked on half-halts, walk/trot, walk/halt transitions and she taught him how to back up. Monarch was just as quiet as if he had been ridden every day since the last ride. 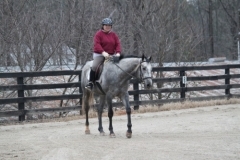 Suellen learned to avoid the other riders in the arena by keeping her head up and her vision open. She also learned to take charge and not let Monarch turn towards the gate. When the ride was finished, both the horse and the rider were happy and relaxed - the best way to end any ride! Monarch's Reign and his mom get to know each other during the month of January. December was too wet/cold/busy to ride.